Hot club inspired bands are far from a rarity on the UK jazz scene, but what marks Djangologie out as something special is the way they take the original spirit of music and breathe new life into it. Noted for the way that they maintain the swinging spirit of the great Reinhardt-Grappelli ensembles but without trying to be a carbon copy, the music of Djangologie is firmly rooted in the Hot Club sound of the swing era. This can be found in the virtuosic performances of the time honoured 1930s hot club classics and a repertoire of exquisitely written, gypsy jazz originals. This is inspired rather than deferential homage. All four members share a detailed understanding of the gypsy jazz tradition, coupled with a broader appreciation of the developments in jazz throughout the 20th century. It is with this that they are able to generate the sound and excitement of the Hot Club du France ensemble, whilst preserving their own unique identity. Played with virtuoso brio by four of the finest exponents of the style, the essential commitment to music rooted in the sound of Django Reinhardt remains absolutely at the heart of their approach. Guitarists James Birkett and Giles Strong combine immenst versatility with a profound love and understanding of the history of Stephane Grappelli but also inbues it with traces of her other musical passions - classical music and bluegrass. Founder member (and composer) Mick Shoulder anchors the group with a big bass sound and a driving rhythmic pulse. 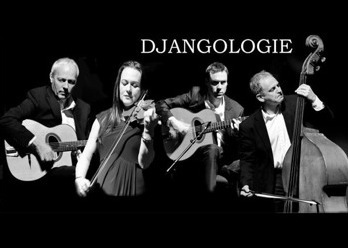 With their intense brand of swing, Djangologie continues to draw, thrill and entertain ever-increasing audience numbers; converting the new and definitely supplying the goods to any hot club aficionado. However you choose to describe the music, one thing in indisputable - it really is tres bonne. "Djangologie evoke the authentic sound of Django Reinhardt and Stéphane Grappelli"
"A spirited celebration of the Hot Club"